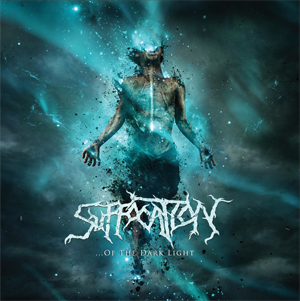 New York death metal pioneers SUFFOCATION will release their new album ...Of The Dark Light on June 9 via Nuclear Blast Records. The band has released the first single, "Your Last Breaths", in the form of a 360º track video, below. "The moment we have been waiting for is here, our new album ...Of The Dark Light will finally be released through Nuclear Blast on June 9, 2017! Over the last 4 year period SUFFOCATION has taken its time to write this record and we couldn't be prouder. It is our most brutal record yet! "SUFFOCATION worked through the end of 2016 to hash out and lay down the tracks at Full Force Studios with Joe Cincotta and once again enlisted Zeuss to bring this creation to life! Myself, Frank Mullen, Charles Errigo, Eric Morotti and Derek Boyer have all pushed the limit of what SUFFOCATION is and we hope you enjoy it! We also had the honor of having Colin Marks handling our artwork which is a new frontier for us and a different avenue and style to the traditional SUFFOCATION records. We also included some backup vocals from Kevin Muller (THE MERCILESS CONCEPT) which for us makes this album very unique! This will be our 10th studio release and we really hope you like ...Of The Dark Light! Keep the grind alive and hope to see you on the road!" "The Warmth Within The Dark"
"Some Things Should Be Left Alone"
Pre-order ...Of The Dark Light in various bundles and formats, HERE. Receive the song "Your Last Breaths" instantly, when you pre-order the album digitally through iTunes or Amazon.